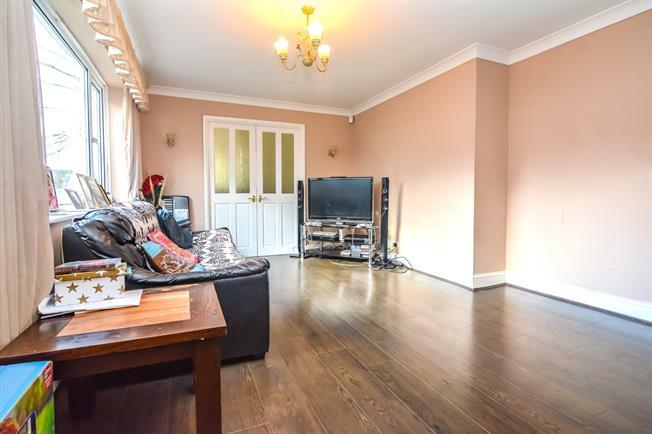 This deceivingly spacious family home is boasting with potential and is located in the ever popular area of Lee Chapel North. Situated between Basildon or Laindon train station both offering links into London via the C2C line. The property sits on a corner plot and offers a larger than average rear garden with a sizeable patio area perfect for relaxing in the summer and perfect for children with a laid to lawn area for a playing area. The garden also features a rear gate with direct access to communal parking bays ideal for bring in the shopping. Internally the property offers 2 reception rooms, fitted kitchen, downstairs WC and a study space all spread across the ground floor. Upstairs there's 4 generously sized bedrooms, ample storage space and a family bathroom. This home is perfect for any growing family with a wealth of living space and bedrooms on offer while externally offering a large amount of garden space perfect for all the family. Double glazed window overlooking the garden. Radiator, laminate flooring, painted plaster ceiling, original coving, ceiling light. , opening onto the patio. Double glazed window. Radiator, laminate flooring, painted plaster ceiling, original coving, ceiling light. , opening onto the patio. Double glazed window. Tiled flooring, tiled splashbacks, painted plaster ceiling, downlights. Roll edge work surface, wall and base units, one and a half bowl sink, space for, range oven, overhead extractor, space for washing machine, fridge/freezer. Double glazed window. Radiator, tiled flooring, tiled walls, painted plaster ceiling, downlights. Touch flush, wash hand basin. Double glazed window. Radiator, laminate flooring, a built-in wardrobe, textured ceiling, ceiling light. Double glazed window. Radiator, laminate flooring, textured ceiling, ceiling light. Double glazed window. Laminate flooring, built-in storage cupboard, textured ceiling, ceiling light. Double glazed window. Heated towel rail, tiled flooring, tiled walls, painted plaster ceiling, downlights. Touch flush, panelled bath with mixer tap, pedestal sink with mixer tap.